March 22, 2012: A recent flurry of eruptions on the sun did more than spark pretty auroras around the poles. NASA-funded researchers say the solar storms of March 8th through 10th dumped enough energy in Earth’s upper atmosphere to power every residence in New York City for two years. 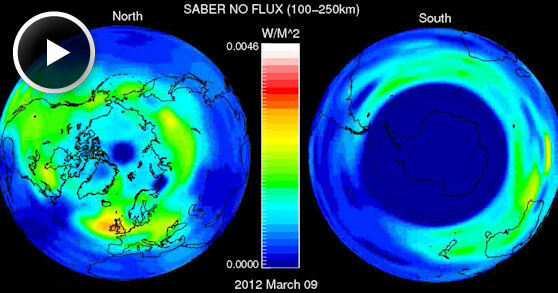 Earth's atmosphere lights up at infrared wavelengths during the solar storms of March 8-10, 2012. A ScienceCast video explains the physics of this phenomenon. Play it! Mlynczak is the associate principal investigator for the SABER instrument onboard NASA’s TIMED satellite. 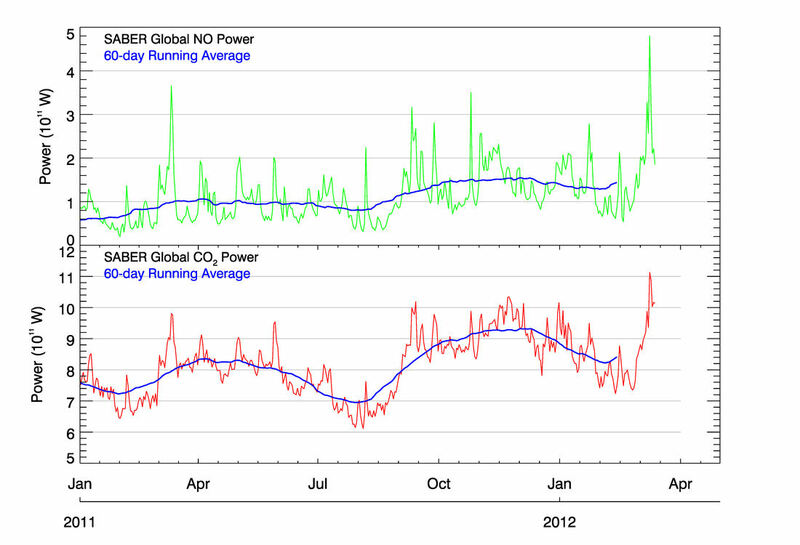 SABER monitors infrared emissions from Earth’s upper atmosphere, in particular from carbon dioxide (CO2) and nitric oxide (NO), two substances that play a key role in the energy balance of air hundreds of km above our planet’s surface. That’s what happened on March 8th when a coronal mass ejection (CME) propelled in our direction by an X5-class solar flare hit Earth’s magnetic field. (On the “Richter Scale of Solar Flares,” X-class flares are the most powerful kind.) Energetic particles rained down on the upper atmosphere, depositing their energy where they hit. The action produced spectacular auroras around the poles and significant1 upper atmospheric heating all around the globe. For the three day period, March 8th through 10th, the thermosphere absorbed 26 billion kWh of energy. Infrared radiation from CO2 and NO, the two most efficient coolants in the thermosphere, re-radiated 95% of that total back into space. In human terms, this is a lot of energy. According to the New York City mayor’s office, an average NY household consumes just under 4700 kWh annually. This means the geomagnetic storm dumped enough energy into the atmosphere to power every home in the Big Apple for two years. During the heating impulse, the thermosphere puffed up like a marshmallow held over a campfire, temporarily increasing the drag on low-orbiting satellites. This is both good and bad. On the one hand, extra drag helps clear space junk out of Earth orbit. On the other hand, it decreases the lifetime of useful satellites by bringing them closer to the day of re-entry. The storm is over now, but Russell and Mlynczak expect more to come. More sunspots flinging more CMEs toward Earth adds up to more opportunities for SABER to study the heating effect of solar storms. "This is a new frontier in the sun-Earth connection," says Mlynczak, "and the data we’re collecting are unprecedented." Stay tuned to Science@NASA for updates from the top of the atmosphere.